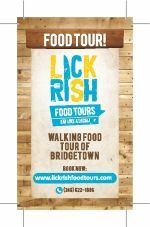 Lickrish Food Tours invites you to to eat like a Bajan and learn some great history​ along the way on their Walking Food Tours of Bridgetown. Experience the UNESCO World Heritage site of Bridgetown along with some awesome local culinary delights. Become enlightened with the history of our great capital city and eat like we do! You're sure to enjoy the treats in store for you. Knowledgeable and entertaining guides will share insightful stories that reveal the culture and often untold history of Bridgetown. - 6+ Bajan tastings, bites & sips included, enough for lunch. Duration: about two and a half to three hours, along a modest 1.5 mile walk. Wear comfortable footwear, casual clothing, protective sunwear, and Sunscreen. ​See attached flyers for more details.